Peters, also known as calypsonian Gypsy said Princes Grounds, the sight on which NAPA was constructed, housed the Calypso Revue tent, also known as Kitchener’s tent prior to the construction. “He performed here, so it is only appropriate that we honour him in this manner. Kitchener’s tent was here for many, many years. I sang here, my grandparents used to come here and party. I am going ahead with the name, and it would be done in the short order,” said Peters. Peters said he has been lobbying for the name since he was in Opposition, but now he has the opportunity to do it. The auditorium at NAPA has been unnamed since it was constructed. Speaking after the tour to members of the media, Peters said he saw NAPA as a beautiful building. “It is an impressive building, but there is evidence of a lot of shoddy work”. He claimed it was evident that a lot of inferior materials were used in the construction and furnishing of the building. “Everything here looks hurriedly done because of the criticism that was leveled against the administration and the place, it had to be completed quickly,” Peters stated. Another flaw which Peters pointed out was the limited seating capacity of the auditorium. “For the kind of money spent on this building, the seating capacity is too small. There are a lot of rooms, but if you want to put on a big show inside here, where are you going to keep it? I think it holds the same amount as Queen’s Hall,” stated Peters. Peters said his Government has no plans to renovate, or add to NAPA, “If the artistic fraternity, for which this place was built, has a problem with it, then something will have to be done eventually.” he added. Does this tid bit of news really requiree headline billing? I think it is a good move to eventually honour Kitchener in the Arts Center given his history to the site. However, unless the issues of corruption and poor workmanship are satisfactorily dealt with, it would be a dishonour to have Kitchener associated with it. I would suggest holding off this naming exercise until the controversy surrounding this building is settled. I hope to meet the Blacksungod one day in heaven , or eart,as the first question I plan to ask is, why do black folks allow themselves to be conveniently used, abused, misused, and then discarded , so easily from all other self professed superior groups, from time immemorial, to present – but most importantly , especially in Trinidad and Tobago? Here is another classic example. This building was publicly denounced by the present regime, as a symbol of waste, corruption, useless grandeur ,and everything terrible- as represented by the past government- while the core of it members were in the Opposition. Today , the first move they wish to make moving forward, is to again subtly try and tarnish the name of one of our country renown, unacknowledged cultural ambassadors Lord Kitchiner, in the guise of national multicultural inclusion. Fortunately, our astute President did not fell for the recent political trap recently , when he was offered the much decried PM’s multimillion white elephant house, as a temporary residence. It is my hope that the Roberts family is not that desperate ,or they would be advised to say no to this dishonor. Here is a suggestion, Madam K, instead, call it the ‘Kamaluden Mohammed House of Art,’ as a sign of gratitude for the long time El Socorro/Aranguez PNM Statesman stalwart job through the years for East Indian culture ,via the lovely Mastana Bahar Show. Better yet, I think a similar great honor would be done, to name it the ‘V.S Naipaul Complex,’ after our respected Chaguanas, Nobel global Literature hero. Later down the road , if money permits other types of efforts to permanently honor the Grand Master and other selfless national artist . NAPA should be renamed Trinity Cultural Centre (TCC). That way all art forms can be embraced. Lord Kitchner should be recognised in the building by having a Lord Kitchner seating section. Why are we so afraid to name buildings and institutions after real people? I believe that NAPA should be named after Beryl McBurnie who was our first lady of the arts. While Ms. McBurnie can stand on her own, it would be fitting since we now have a woman prime minister. 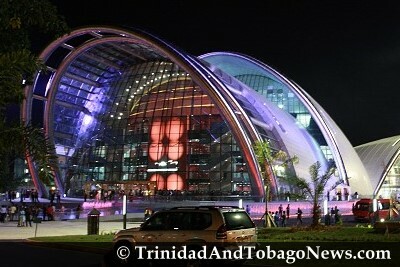 This is the reason why it should be name Trini Cultural Center. It will embrace all the cultural streams in T&T. Beryl was in a class of her own and so to Kitch, Sundar Popo, Denise Plummer etc. To identify a cultural building with only one art form or artiste is morally and ethically wrong. I am not saying that Kitch should not ocuppy a special place in recognizing his contributions but there are certain ways to do that… Just ask Jack Warner.